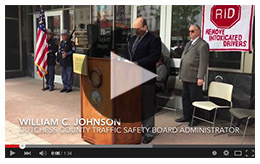 Poughkeepsie…Dutchess County Executive Marcus J. Molinaro joined the Dutchess County Chapter of Remove Intoxicated Drivers (RID) today for the 32nd annual “DWI Victims Memorial Ceremony” to honor the memories of Dutchess County victims of DWI crashes. Friends and family gathered as 44 victims’ names were read and balloons were released in their memory. The goal of the event is to heighten public awareness of alcohol related fatalities and the impact of impaired driving on the community. The RID Ceremony included the presentation of the annual Jo Johnson Memorial Scholarship, which is given in memory of Josephine “Jo” Johnson who founded the Dutchess County Chapter of RID in 1981. The scholarship was presented to Danielle Fergus of Millbrook High School. 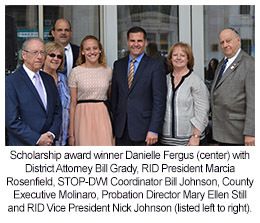 Following the RID Ceremony, Dutchess County Executive Marc Molinaro and Dutchess County District Attorney William Grady, along with state and local law enforcement representatives announced countywide law enforcement participation in a special STOP-DWI enforcement effort to crackdown on impaired driving. These efforts are part of the “Drive Sober or Get Pulled Over” Crackdown Enforcement project. The Memorial Day crackdown efforts start May 22nd and will end May 26th. The Dutchess County Sheriff’s Office, as well as local law enforcement personnel will be out in force in this coordinated multi-agency effort to reduce the number of alcohol and drug related injuries, crashes and deaths during the holiday period. Memorial Day week is historically a deadly period for impaired driving and represents the beginning of the traditional summer season. In addition, there will be parties and barbeques to celebrate graduations, proms, communions, confirmations and warm weather. This combination of factors equates to more people on the road in general and more specifically, driving impaired. 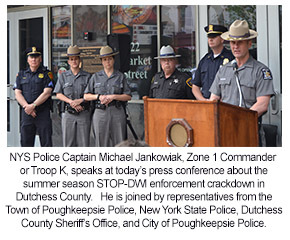 The Memorial Day Weekend Crackdown is one of many statewide enforcement initiatives promoted by the New York State STOP-DWI Association with additional funding from the STOP-DWI Foundation with a grant from the Governor’s Traffic Safety Committee. Dutchess County was 1 of 44 County STOP-DWI Programs awarded grant monies totaling more than $2.2 million to support 330 participating Law Enforcement agencies statewide. Dutchess received $128,700 to coordinate the enforcement project countywide. The Statewide STOP-DWI Crackdown Campaign also targets 4th of July and Labor Day weekend, Halloween, and the national holiday season in December.